Bayburt Castle will regain its old appearance with purple and blue tiles. Bayburt Castle, the third largest in Turkey by residential area, was mentioned as "Çinimaçin Castle" in historical sources because of the use of tiles on its walls. The castle, which now lies in ruins, will be restored to its old glory. 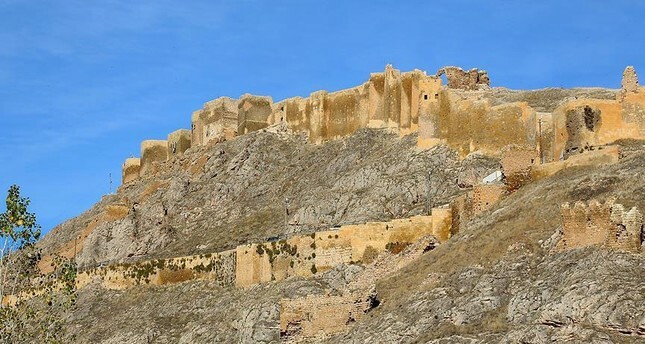 Bayburt Governor Ali Hamza Pehlivan said that significant findings have been made on Bayburt Castle's history. The research work was done as part of the second phase of the restoration works. Pehlivan added that excavation and restoration works, initiated by the Ministry of Culture and Tourism under the directive of Bayburt Museum Directorate in 2017, will continue this spring. "We will restore the castle, which was known as the 'Çinimaçin Castle' in historical resources because of its distinct purple and blue tiles," he said. The tile motifs and plans were made after a year of research. The findings suggest the tiles used at Bayburt Castle had a great resemblance to Seljuk motifs. The restoration will begin once the exact motifs and designs are determined, which is key in terms of sustaining the historical heritage of the structure. "With the careful placement of the tiles, which will bear the traces of our ancestors, the castle will once again regain its old, unique appearance," Pehlivan said.